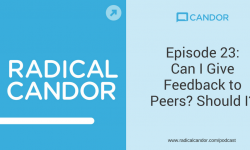 Kim and Russ talk through some steps for building a culture of Radical Candor across your team or organization. First, focus on yourself. Kim and Russ tell stories about how they look inward — Kim talks about the feedback she got when she was working on the book, and Russ tells a story about getting feedback from Kim on an email he sent. Everyone makes mistakes, but by looking within and helping call each other out, we can get it right more of the time. 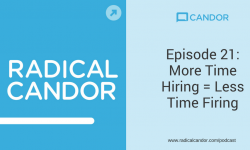 Next, Kim and Russ talk about spreading Radical Candor outward. They answer a listener question about causing change as one person in an organization, that is “nice”. 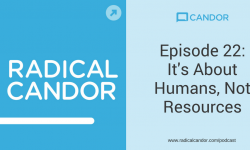 The episode ends with specific tips for building a culture of Radical Candor. Tip 1: Create a shared vocabulary. Tip 3: Use frequent reminders. Listen to the episode for explanations of these tips. Radical Candor, the book, and the Candor Coach iOS app both launched today! To celebrate, we announced a new giveaway in today’s episode. For a chance to win a copy of Radical Candor, sign up to try our app free. All you have to do is download from the App Store on iOS and log in. See you next week with another episode from Kim and Russ! I’m not able to find the app. Was it removed from the store? Yes. We’re no longer building/offering the apps. They weren’t as effective as we wanted them to be and we decided that we wanted to spend some time working closely, in person, with organizations who are excited about the idea before we revisited the software angle.